Confession time: I go through a lot of notebooks. A lot. I’m talking oodles of doodles, piles of paperwork, sizable, human-crushable stacks of my semi-legible scribblings. I may be single handedly responsible for the destruction of a hectare or more of precious Amazonian rainforest, who’s to tell?? I’ve already introduced you to my Revision Binder, where I keep all my editing notes for my WIPs. In addition to that binder, though, I like to keep a spiral notebook for all my daily scribblings and note-takings. Now, don’t get me wrong, I still fill files and files and folders upon folders on my computer with my brilliant (or belligerent, again, who’s to tell) prose. but there’s something about the tactile experience of putting pen to page that helps me to sort out my thoughts like no other. Sometimes I’ll stop writing a scene on the computer and switch to working it through in a notebook, just because it makes my brain feel better. If you’ve ever been interested in creating a notebook dedicated to your writing, or you’re just curious how I set mine up, settle in! I’ve got pictures and an unhealthy addiction to washi tape to show you. Decorations for the cover. I never decorate my covers (mostly because I choose my notebooks specifically for the color of their covers), but you could decoupage yours with aesthetic pictures that represent your WIP, for example, or snippets of your own writing, or a big honking quote about writing — whatever you want! Once you’ve got your workspace arranged (and your photos for Instagram snapped, of course), it’s time to put together your notebook. A caveat: Every writer is going to have a different process, require different features, benefit from different things. I don’t use indexes, for example; another writer might find them helpful. Use this post as a launching pad, and figure out what features you want your notebook to include. I like to start my notebooks with the best of intentions, and that means a checklist on the very first page of all the brilliant writerly things I intend to accomplish over the next thirty days. Do I always get these items accomplished? lol no of course not. But having goals lends your writing time structure and focus, and can make an overwhelming WIP or editing project that much more manageable. A specific word count you’d like to hit daily, or weekly, or for the whole month. Other important dates or reminders — Consider this page your launching pad, and put down anything you might like to remember. Okay, I know it’s September and not technically NaNoWriMo, but I love this word count tracker from bohoberry.com, and use it in all of my writing notebooks. Some months, I use it to track my word count as it’s intended; other times, I use the tracker to keep an eye on how many words I’ve edited. You don’t have to use a graph like this; you could make a table, for instance, of the chapters you want to write; or, you could paste in a calendar to help you track your writing time. Whatever you choose, it’s nice to have an overview of your writing process–it keeps you accountable, and it’s especially helpful to have that proof, on low days, that you are making progress, no matter how frustratingly gradual it might seem. Anything else you think you might like to reference. Maybe you need a list of the spells cast in your world, or a map of your fictional setting. Now, we beautify! I like to add washi tape headers to random pages — not every page, mind you, but enough here and there that the notebook looks pleasing to flip through. I also like to print out motivational quotes related to writing and include them on random pages for more little bursts of encouragement. 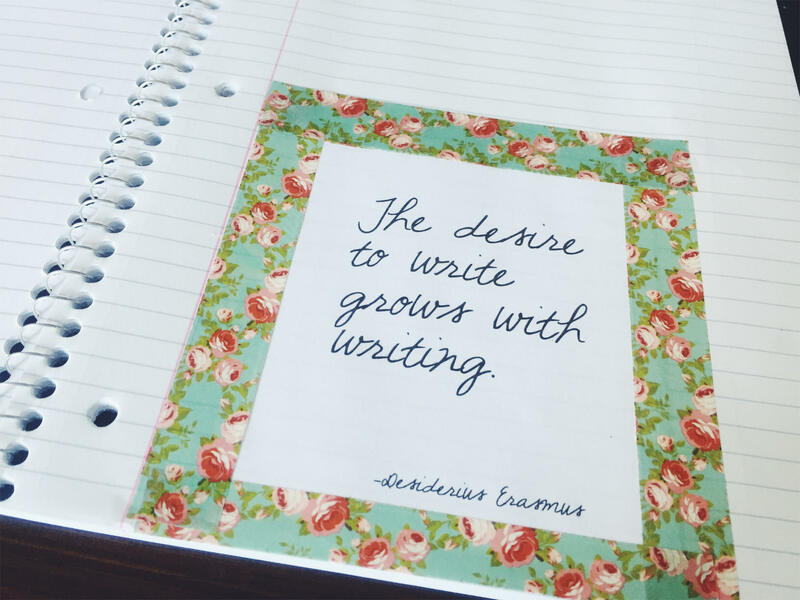 I’ve even made a Pinterest board of writing-related quotes, so I always have a few to choose from as I paste together a new notebook. If you’re hankering for some motivation, check it out below! Since I’ve chosen not to index, I don’t use page numbers, but I do like putting the date at the top of every page and, once it’s filled, jotting down a brief summary of that page’s contents. There are all sorts of pages you could add to your notebook. Maybe you include a page of sentences or paragraphs you’re really proud of writing, to read back over on low motivation days. Or, print out images that remind you of your characters or story, to flip through and inspire you. A collection of beautiful words you’d love to use. Make your notebook work for you — but don’t forget, this book is meant to filled up with your brilliant, beautiful prose, so leave yourself plenty of room to pontificate! Do you decorate your notebooks? Or do you even like to write by hand? Lots of people never do, and only type their stories on computers! Which is your preferred method of plot construction and reader destruction? Leave a comment below, let’s talk! Be sure to follow Happy Writer on BlogLovin’, or subscribe to the blog via email in the sidebar and have new blog posts sent your inbox every Monday. And be sure to follow me on twitter (chuffwrites) and instagram (yellowhairedrobot)! Dream Crate: A Loot Crate for Writers!